If you love Pfitzner’s Palestrina, you are going to want this. That is a big “if” though, as the composer’s best-known work divides opinion, exciting near fanatical devotion in its admirers, but leaving others wondering what the fuss is all about. Die Rose vom Liebesgarten is an earlier work, Palestrina was completed in 1917, this in 1901, but the similarities outweigh the differences. Where Palestrina inhabits a devout and reverential soundworld, Die Rose is more fairytale, but with a similar combination of solemnity and mystical aura. 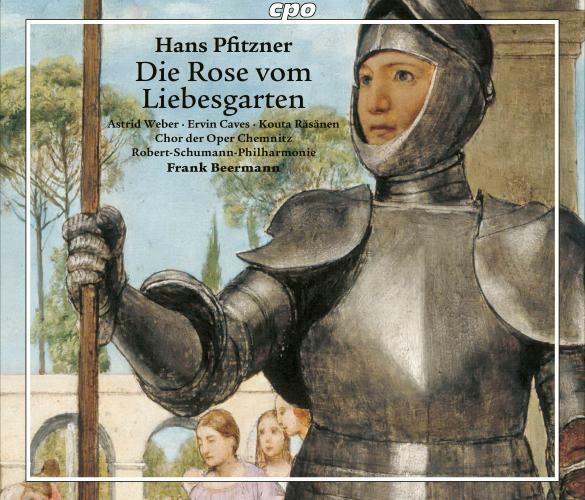 Although this an audio-only release, it is also clear that Die Rose shares the greatest failing of Palestrina, the inability to function effectively as staged drama. But if you don’t worry too much about the story, or the flimsy allegorical characters, and just listen to the music, there are many delights here, and this new recording presents the work in the best possible light. As usual, CPO provide full documentation, the accompanying booklet containing a side-by-side German and English libretto, a substantial essay on the work and cast bios (all translated into beautifully idiomatic English), and a brief story synopsis. Given the care with which all this is done, the brevity of that synopsis is surely intentional: They don’t want us dwelling too much on the story. So I’ll be brief: Pfitzner and his librettist, James Grun, elaborate on a series of paintings by Hans Thoma, one of which features on the album cover. They depict a make-believe medieval world, all knights and sorcerers. The music of the opera continually struggles to move out of the direct influence of Wagner, and the libretto offers no help at all. The hero is a knight named Siegnot (yes, really! ), and just as in Wagner, the early formalities involve him coming by the name and learning its significance. The eponymous “Garden of Love” is inhabited by Flower Girls, more Rhinemaidens and Flowermaidens, and we also meet a “Bog man,” clearly modeled on Mime. The Bog Man tells Siegnot of Minneleide, trapped in an enchanted underworld by the Night Sorcerer and his dwarves (so, still half in Rheingold). Siegnot attempts to rescue Minneleide. Both die in the process, but are reunited in death to spend eternity in the Garden of Love. The music sits somewhere between Wagner and Palestrina. Pfitzner occasionally wanders into Parsifal for a few bars, but then returns to a more distinctive style. There are two prominent Leitmotifs, a stirring horn call, played out in daringly long notes at the opening, and a swooning romantic theme: Both are memorable and distinctive, aiding the score’s individuality. Those motifs translate well to the vocal writing as well, which has an endearing speech-like quality, but which also blends well into the orchestral textures. The orchestration is truly Wagnerian, a definite quality, with prominent horns, interesting, if subtle percussion, and richly voiced string accompaniments. The booklet essay, by Michael Schwalb, gives an overview of the work’s performance history. An early advocate was Bruno Walter, who appealed to his boss at Vienna Opera, Gustav Mahler, to conduct it there. He eventually succeeded thanks to the intervention of Alma, whom Walter won round to the cause. The Vienna production wasn’t the first, but it put the opera on the map. In an interesting aside, Schwalb discusses the significance of the opera on later Viennese composers. Schoenberg, Berg, and Webern all attended Mahler’s Vienna performances. Webern soon quoted the music in his Five Orchestral Pieces, op. 10, while the long-held horn notes in the introduction not only found their way into Marie’s death scene in Wozzeck, but even inspired Schoenberg’s theory of Klangfarbenmelodie. Given that historical significance, the opera is clearly due an airing, and this recording is all that Pfitzner fans could hope for. The recording is from live performances in Chemnitz, the company there taking an even bigger gamble in actually staging the work. The production was directed by Jürgen R. Weber, and from the production images it looks to be a suitably lurid affair. The sound quality on the recording is very good, but it does sound like it is taken from the stage, with voices occasionally distant. The musical standards here are excellent, suggesting a committed company-wide project to do the best for this neglected work. Frank Beermann conducts with efficiency and clarity; he doesn’t over-sentimentalize, but he always gives this highly Romantic music its full expressive weight. That said, I wonder what Kubelík would have made of this score, given his sublime transformative power with Palestrina, an opera that you won’t hear the same again after you’ve heard his recording. For that matter, it is interesting to speculate what Mahler made of it. Beermann is probably less expansive, and a little more relaxed, than either of those giants, and he gives the impression of moulding the music to his own personal vision. Vocally, this performance is excellent, almost uniformly so. Tenor Erin Caves is confident and secure as Siegnot, and is ably partnered by soprano Astrid Weber as Minneleide, her tone full and rich, though it thins towards the top. One of Pfitzner’s main motifs is a rising octave figure, and some of the singers struggle with the top note, especially in such declamatory phrasing. The worst offender is Andreas Kindshuch as Der Sangesmeister, and his occasionally wayward tuning makes him the one weak link in the cast. No such complaints though for the Chemnitz chorus and children’s choir, who are kept busy thoughout. The orchestra is also on excellent form, and the horn section deserves special praise, providing a key element of this soundscape.